The MENARD 55th anniversary ceremony. 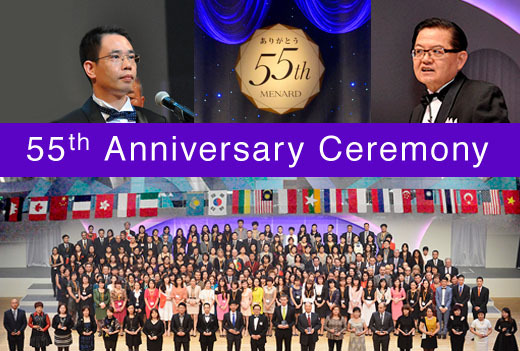 The MENARD 55th anniversary ceremony was held on 26th November in Nagoya Congress Center under the theme of "Toward further progress" . Approximately 1,800 guests from home and abroad were invited. The grand ceremony was worthy to celebrate the 55-year history. It began with the song by Mr. Hiroyuki Kato, tenor singer, and a string ensemble. After the speech by Mr. Nonogawa, President of Nippon Menard Cosmetic, the excellent domestic and foreign distributors were commended. In addition, invitees there enjoyed the lecture by Professor Dr. Hirohiko Akamatsu and the special mini concert by Every Little Thing. We are hoping for further leap of MENARD in all over the world.